An Irish-born infantryman, killed in 1914, will be buried as an unknown soldier, after attempts to trace his relatives failed. 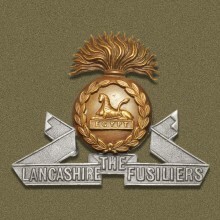 Researchers believe they have found the remains of private James Rowan of 2nd Battalion, Lancashire Fusiliers, who was originally from County Longford. However, an ‘exhaustive search’ to trace living relatives has so far failed. Lynne Gammond of the Army’s headquarters at Andover, Wiltshire, said: ‘It is very sad actually. There was a huge response but we just couldn’t make the link. Private Rowan’s suspected remains were among six sets found close to a railway siding near the Belgian village of Comines-Warneton five years ago. He was killed nearby on 20 October 1914 and his name currently appears on the Ploegsteert Memorial to the Missing. The MoD is planning a re-interment and a memorial service for the currently unknown soldier. It will take place on 16 April at the Prowse Point Commonwealth War Graves Commission Cemetery in Belgium. The suspected private Rowan will be buried next to his five former comrades, who were also designated unknown soldiers after attempts failed positively to identify them. This entry was posted in Events and tagged 1914-1918, Belgium, First World War Centenary, Lancashire Fusiliers, Ploegsteert, Private James Rowan, Prowse Point, WW1. Bookmark the permalink.